The Commercial Law League of America (“CLLA”) is a respected organization of attorneys and other experts in credit and finance actively engaged in the field of commercial law, bankruptcy and insolvency. The CLLA strives be the leader in providing legal, educational and professional services to the business and credit communities. 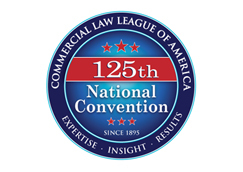 The CLLA membership is comprised of national and international attorneys who handle commercial law, bankruptcy, insolvency, retail collections, construction law and complex commercial litigation matters. Membership also includes collection agency members, law list publishers and commercial credit professionals.